Round-2 of INMRC featuring 16 Motorcycle races & Round-1 of Drag Racing Championship to be held at MMST, Chennai. Chennai, July 4: The MRF MMSC fmsci Indian National Motorcycle Racing Championship will be shifting gears here this weekend when the second round is held at the MMRT track which will witness a total of 16 races across various categories. The programme also includes the first round of the MMSC fmsci Indian National Drag Racing Championship 2018 on Sunday. Races will be held in the premier Super Sport Indian 165cc class besides the Pro-Stock (301-400cc and 165cc), Novice (Stock, 165cc) and Girls (Stock, 165cc) categories. Further, two of country’s leading bike manufacturers, Honda and TVS, will be running their own One-Make Championships in association with the MMSC, in the Open and Novice categories. The most significant development is that for the first time ever in the National championship slick tyres will be used in races. MRF will be supplying slick tyres for the Super Sport Indian 165cc and Pro-Stock 301-400cc categories. This is a path-breaking move as the MRF slick tyres are expected to see improved lap timings in view of the better traction, especially through the corners, they afford than the conventional tyres. 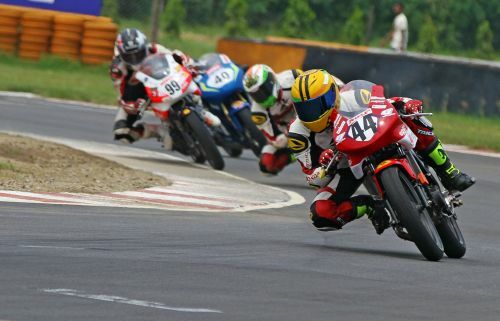 While the focus will yet again be on the “big boys” in the Super Sport Indian 165cc class, there is much to rejoice in the fact that the Novice category, a move initiated by MMSC last season to promote racing at the grass-root level, has yet again attracted over 40 entries, requiring two heats and qualifying sessions followed by a point-scoring race to identify the winner. Similarly, the “Idemitsu Honda India Talent Cup 2018 organised by MMSC” one-make championship comprising two categories - Open (CBR 250) and Novice (CBR 150). Honda, in its efforts to spot and nurture aspiring youngsters, have focussed the talent hunt among riders in the 13-17 years age group for the CBR 150 grid. The Open class has some of the top riders in the country who have raced in various international series. The scenario is much the same in the TVS One-Make Championship 2018 organised by MMSC which will have three categories – Open (Apache RR 310), Novice and Girls (Apache RTR 200) – with strong presence of experienced riders in the Open class.